Gbenga Daniel Thinking Of joining APC? 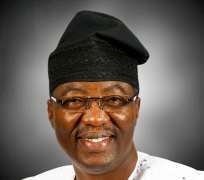 A former Governor of Ogun State and Director-General of the Atiku Presidential Campaign Organisation, Gbenga Daniel, has said he is considering a request by his supporters, to lead them to the All Progressives Congress (APC). Daniel stated this on Sunday, 24 hours after he announced his retirement from partisan politics. He told journalists after a meeting with his supporters from across Ogun State, that his supporters had made it clear to him that he could not quit politics right now. “You know that this process is about leading people and what we have done today is to call all of our people across the length and breath of the state to subject our decision to a kind of plebiscite and, of course, you have seen what they have said. “Basically, they said, well, they agree that I could resign from PDP. They said I must lead them to APC and they said I cannot retire from politics. “That is the summary of what I heard and we have to now take a look at it,” Daniel said.